Harris County Attorney Vince Ryan’s office won a $29.2 million lawsuit against the companies that polluted the San Jacinto River with toxic waste from a paper mill in the 1950’s, and now the County Commissioners have voted to return some of that award to the area where the pollution has affected it most. $10 million of the County’s share will be spent on environmental improvements in the Highlands area, according to County Judge Ed Emmett. In addition, this week State Rep. Wayne Smith announced that the state’s share, approximately another $10 million, will be designated for improvements along the San Jacinto River, and administered by the Texas Parks and Wildlife Department. 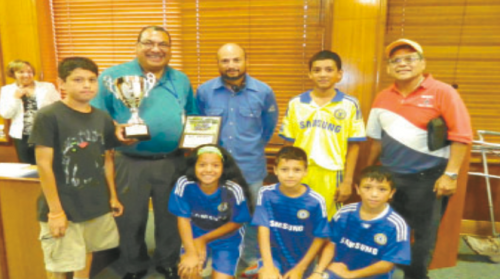 The Galena Park Galaxy Soccer Team won second place in the recent recreation department, city-wide soccer tournament that was held in the park beside Baggett Center. Recreation Director Ernesto Paredes presents the winners with a plaque at the last Council Meeting. Present were coaches Francisco Macias and Rolando Grimaldo, and players Fernando Mendoza, Aramatzi Macias, Eric Zapata, Nathan Gallegos, Axxel Vazquez, Jesus Resendiz, Alejandro Grimaldo, and Nathan Macias. CONGRATULATIONS, GALAXY! 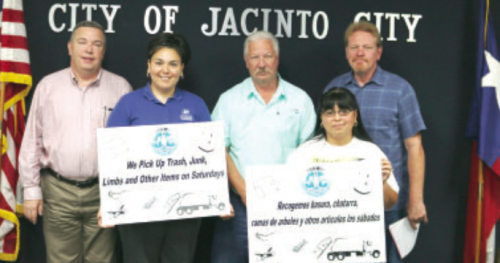 11, 2015, displayed new signs for heavy trash pickup with the hope it will encourage citizens to clean up their property. Mayor Ana Diaz only eight months into her first term as Mayor in May of 2013 made it her goal to return the city’s health conditions back to the former days of better kept homes and yards. She said she was concerned with the unusual large amount of public nuisances throughout the city. Since then Mayor Diaz recently asked for the city to have signs made to display throughout the city informing the citizens that each Saturday they could put on the curbside large items like furniture, building materials, building rubbish, old vessels capable of holding water, refrigerators, ovens and most anything else except tires. Tires will only be picked up twice each year and the city will put the dates of the free Tire Roundup in the city’s quarterly newsletter. The city picks up trash, kitchen garbage, tree limbs and brush twice each week. Tree limbs and brush is picked up without extra charges but only if they’re tied and bundled small enough for easily lifting to place in the waste trash truck.